...We take water seriously and in providing what we believe to be one of the toughest and best handling inflatable Tunnel Hull boats available today, It was a natural progession to inventing a simple Rescue platform that would work easily in just about any situation. We wanted something Strong, Easy to deploy and able to stand up to the worst conditions possible. As simple as using a toboggan yet a very professional tool for serious situations. Anytime. Any place. Any weather. Introducing the next level of inflatable rescue products... Be prepared for anything! The RIT CRAFT is a roughly 12' long , and 4' wide rescue platform. Truly a 4 season rescue device. Inflated from a standard SCBA cylinder, in just under three minutes. Capable of lifting a car yet it weighs in at 47 pounds. ​The open end provides easy extrication of a patient with little or no trauma to the patient. The long ends on the craft protects the victim and creates it's own "eddy" protection. This craft has two "Front ends" depending on the rescue being performed. On ice, the open end it passed out to the patient, so they may rescue themselves. 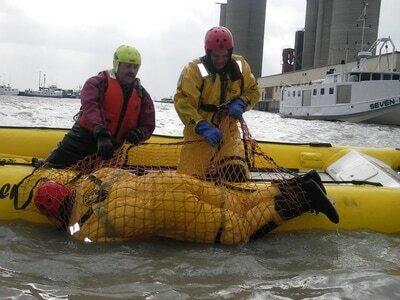 Once on board the craft may be pulled back to shore, under power from the shore crew. 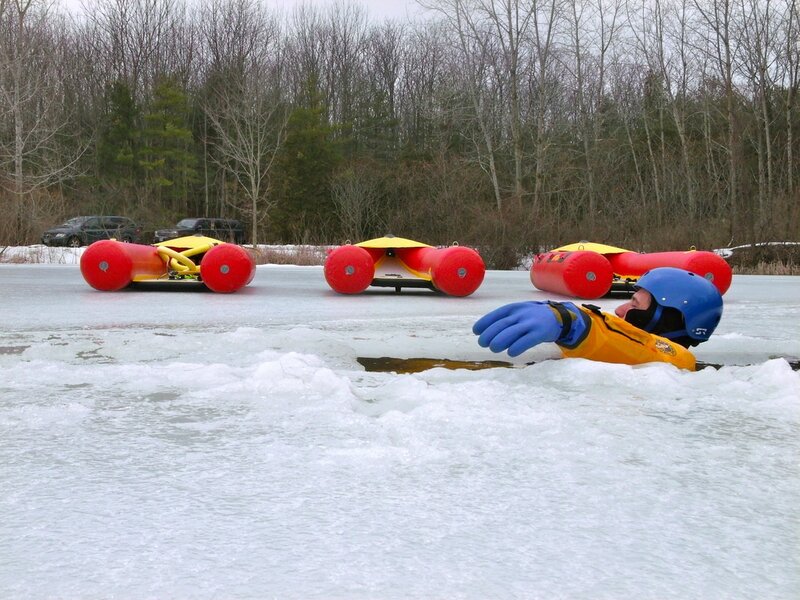 This RIT craft may also be paddled out to the victim and used as a platform on the ice, This device is tethered to shore all the time so that retrieval is simple and readily available. 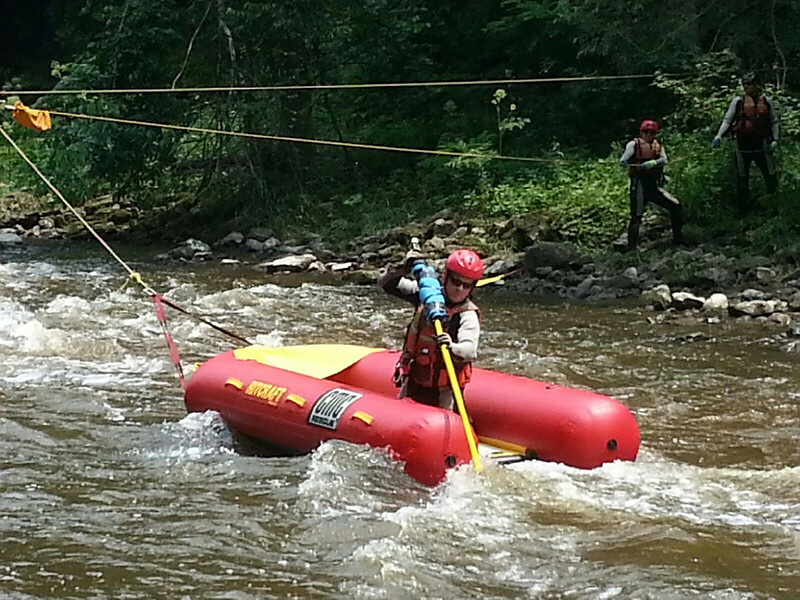 On Ice, in water, on snow or in the mud, this "Rapid Inflatable Tunnel" (RIT) Craft is ready for anything. With 3o years in the professional rescue business, it doesn't take long to realize that in most cases, tools that are simple and versitile work best. After taking a look at all the rescue platforms out there from arround the world, and using them all we thought that we could simplify the rescue platform to be as efficant and practical as possible. There is never enough room to carry all the neat and cool tools out there, or face it..., we would. One tool that does everything, does not exist, but we are getting close. The RITCRAFT was designed to be stored in just about any compartment and weights in at just over 60 pounds. It is an inflatable device that is rugged and extremely tough. It uses 3 PSi of air to inflate and make the device hard. Capable of lifting a car and yet light enough to pull accros the ice or paddle in inches of water with little effort. 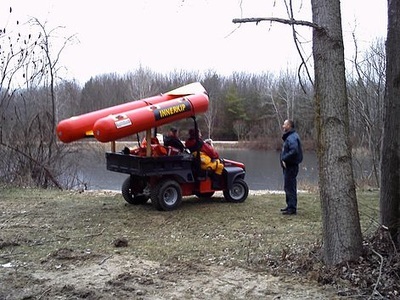 Simpley..., roll out the RITCRAFT and inflate to 3 PSI and you are ready for just about any type of rescue. Durable. Safe. Easy to use. 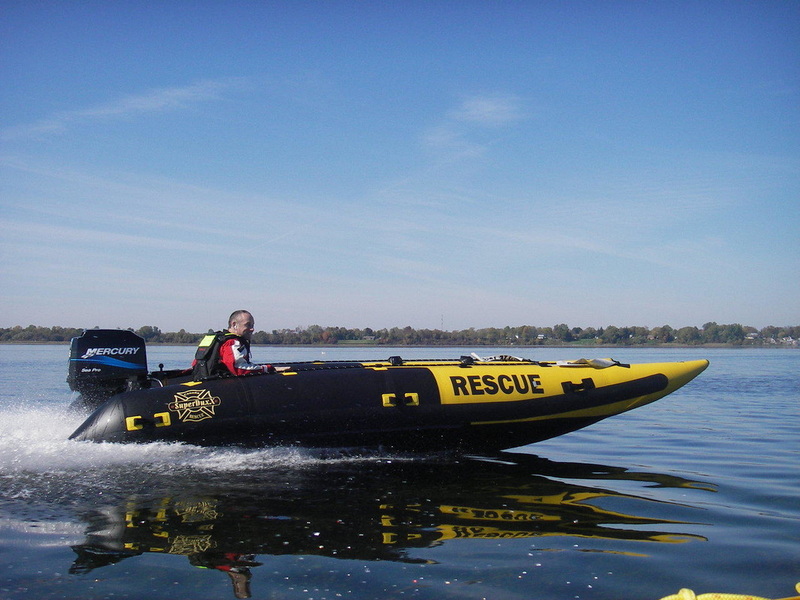 ​A truly versatile, multi-season workhorse for almost any terrain or water type, the RIT-Craft by 2Tinga has myriad rescue applications. 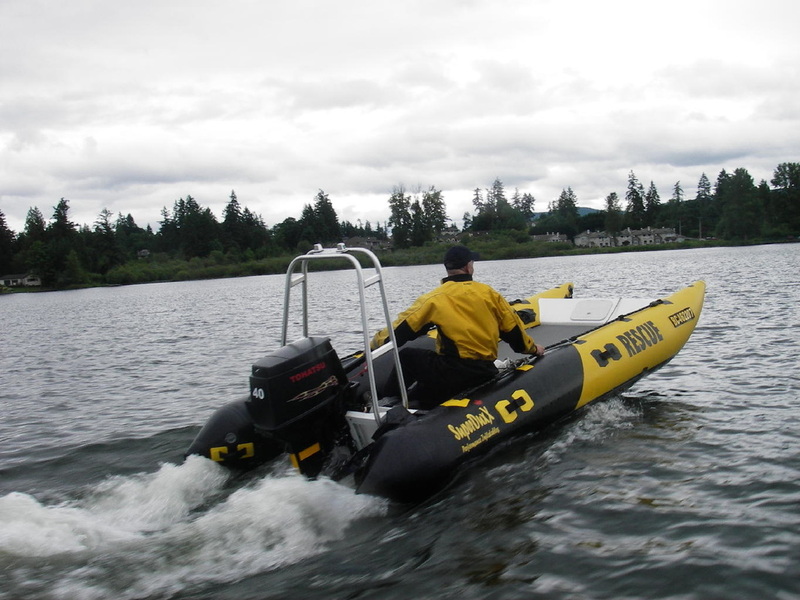 Without costly attachments, it can be easily towed behind a boat or personal watercraft, an ATV or a snowmobile. On ice or snow, it slides across the surface or can be dragged by responders. In open water, one or two people can easily paddle the craft, which tracks extremely well in the water to enable swift patient retrieval. The patient can be placed on the working deck so vital signs can be monitored en route to the shore. The RIT-Craft completely inflates in just over a minute and its compact size when stowed can be stored in most apparatus compartments. Inflatable Tunnel hull boats are quickly becoming the leader in water rescue inshore rescue. 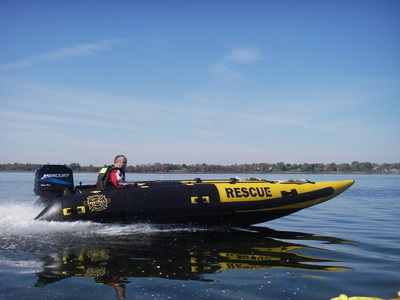 Extremely fast, stable and suited for rescue. With a low front wing, removing a patient is quite simple, also swimming directly into the boat will help with swimming rescues. Extremely fast and quick handling makes driving near shore simple and you will cover a great deal of area doing searches. They will not tip over very easy and feel as solid as being on the dock, when you are at sea. Made for the oceans, but perfect for the lakes as well. 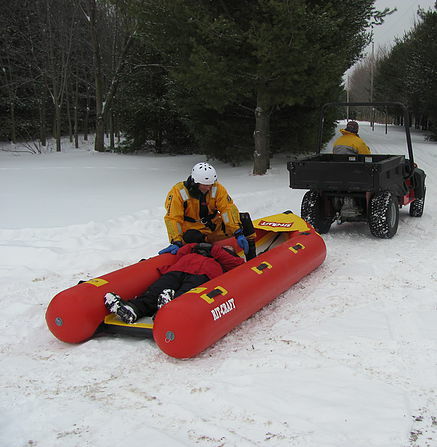 The RIT Sled is a 18 inch by 3 inch thick rescue board approximately 5 feet long, inflatable ice rescue device. Fills in just about 10 seconds off a SCBA cylinder. 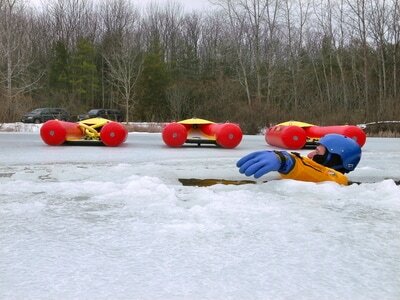 Perfect for ice rescue, very light and will not pull you down. 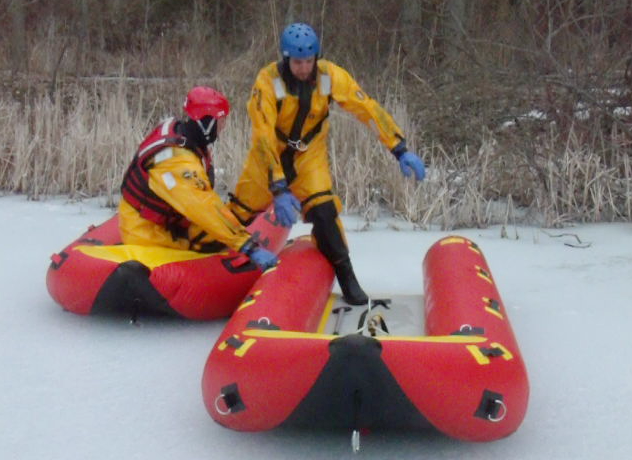 Easily dragged behind the rescuer and facilitates removing someone from the ice in seconds with little effort and discomfort to the victim. Rolls up into a very small package. We also offer quite a range of other water rescue products and we have many, many years of combined water rescue knowledge for your access. We believe that trying our products first and hearing what others have to say, means everything. Please, call and talk to us and see just how we may help. The telescopic 48' reach pole, can be used in various applications, but mainly used in water rescue. It has 3 quick attachments, a float that is attached to the pole all the time, and 1 quick release pin. It also has 2 tag line attachments for safety. *Note* This pole is not for lifting. Reach up to 300' with ease! Simple and easy reach, for crossing lakes and rivers. Truly a long reach from shore. 6 miles of 100 lbs line included in the kit. Simple and easy to use. Also includes 2 weights, and a custom carry bag.